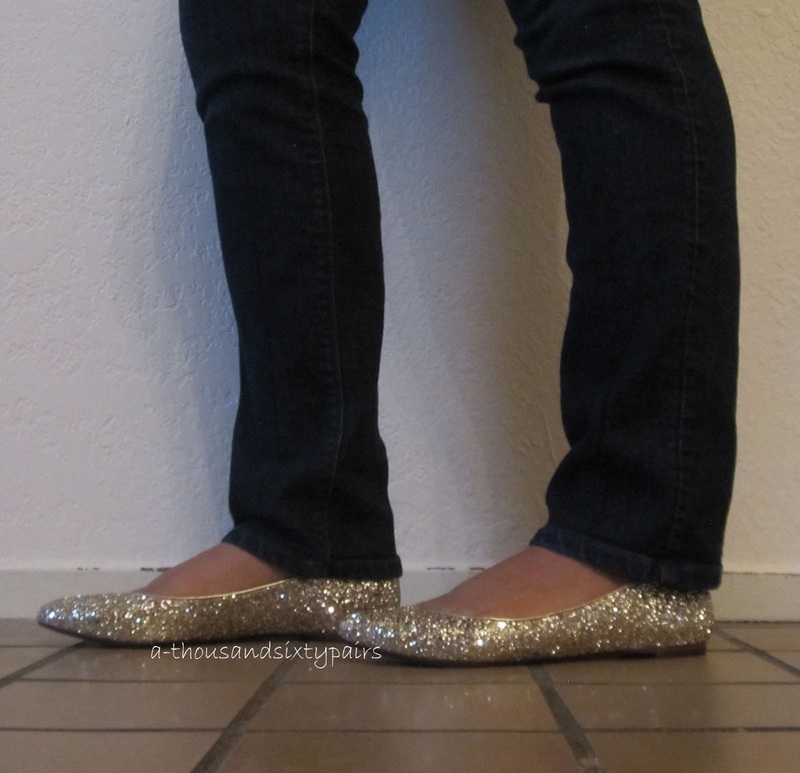 Madewell sidewalk skimmers in glitter (30558, $118) come in hematite (pictured) and light worn gold. They’re now $94.99 online. 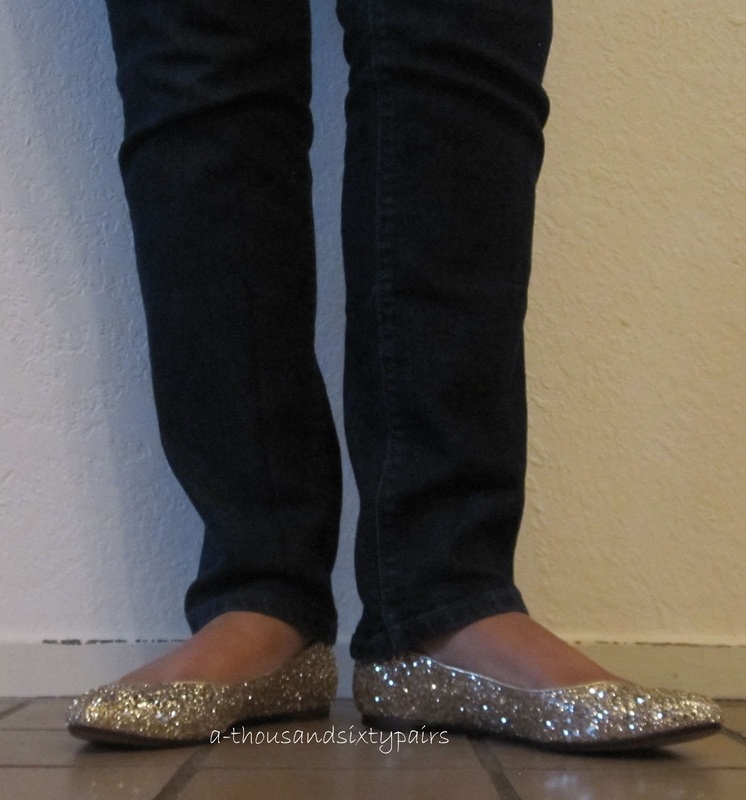 Size 8 – I wear 7.5, but am learning that a tapered toe always guarantees sizing up to 8. My toes are very squared off and I need that extra space. The 8 fit very well in these and I had no interest in trying 7.5. 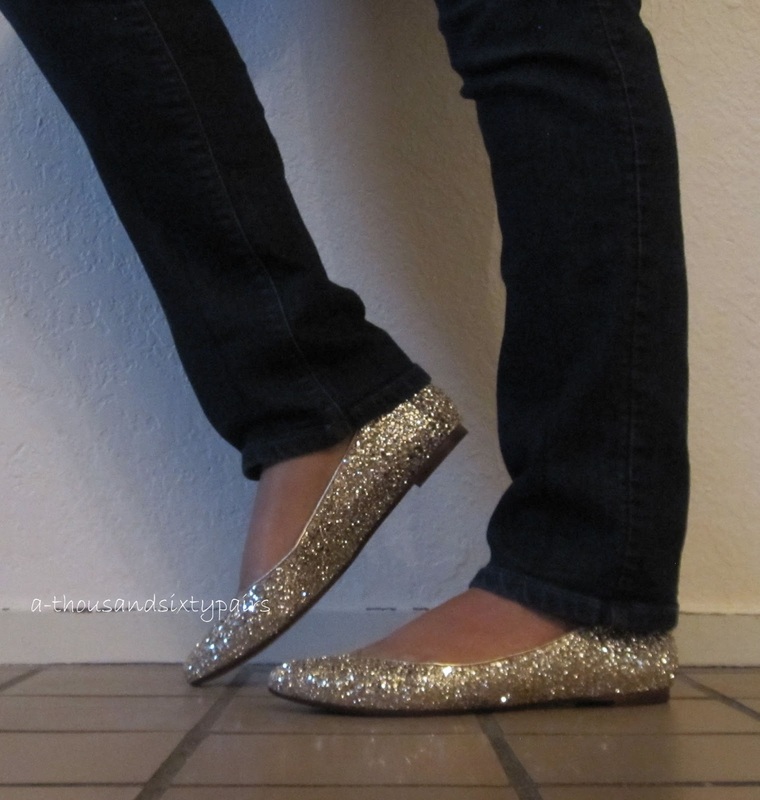 I ended up returning these once I realized I liked the Janey glitter flats (review). The skimmers felt fairly comfortable from the moment I put my foot in. Plus points for that. The glitter didn’t rub off excessively. In fact, I don’t remember much glitter being left behind at all. It’s on there pretty good. I ended up returning these because they were just a bit too sparkly. 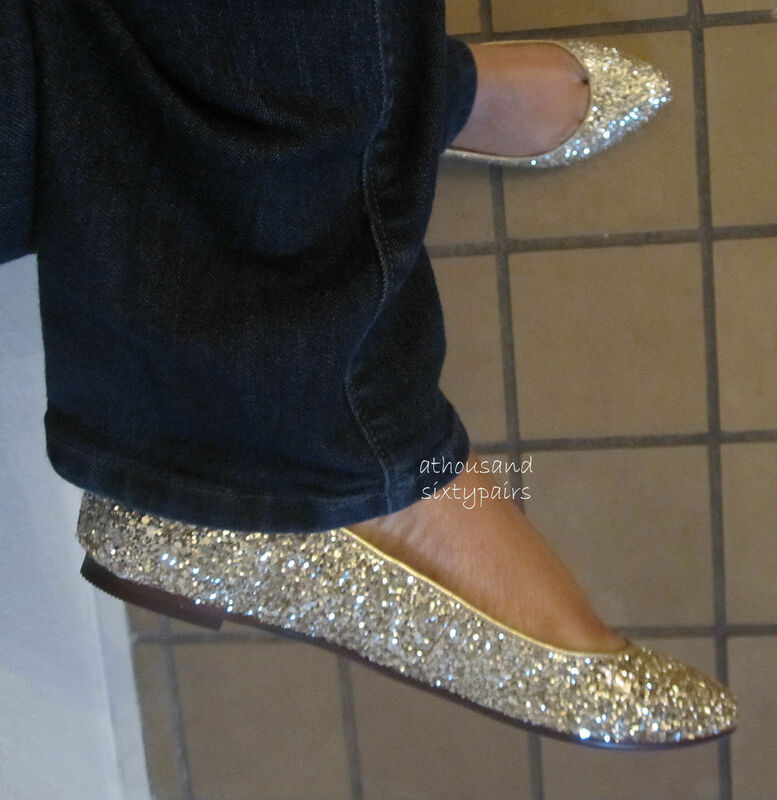 I have worn sequin and glitter shoes in the daytime, but these just seemed a little too sparkly to just ‘throw on.‘ They’re lovely shoes, though. Alison – Thanks so much for the support! I appreciate it. Needed to send you this bit of observation to be able to say thanks a lot the moment again for all the pleasing concepts you have featured on this site. It was wonderfully generous of people like you to allow extensively exactly what some people would have marketed as an ebook to help with making some cash for themselves, precisely considering that you could have tried it if you ever desired. The things likewise worked to be the fantastic way to understand that many people have the identical fervor like my own to know more and more concerning this matter. I know there are thousands of more fun moments up front for individuals that looked over your blog post. Hey there would you mind letting me know which web host you’re working with? I’ve loaded your blog in 3 completely different browsers and I must say this blog loads a lot quicker then most. Can you suggest a good internet hosting provider at a reasonable price? Kudos, I appreciate it! I’m really enjoying the theme/design of your website. Do you ever run into any web browser compatibility problems? A handful of my blog readers have complained about my website not working correctly in Explorer but looks great in Opera. Do you have any advice to help fix this problem? What’s Going down i am new to this, I stumbled upon this I’ve discovered It absolutely useful and it has aided me out loads. I hope to give a contribution & assist other users like its aided me. Great job. I just want to say I am just very new to blogging and truly enjoyed this website. Almost certainly I’m likely to bookmark your website . You definitely have really good stories. Thanks for sharing with us your web page. I just want to mention I am just new to weblog and really loved you’re web site. More than likely I’m want to bookmark your blog post . You actually come with awesome article content. Thanks for sharing your blog. I just want to tell you that I am just newbie to blogs and definitely enjoyed this web-site. More than likely I’m going to bookmark your site . You absolutely have really good article content. With thanks for revealing your blog. I just want to tell you that I am just all new to blogs and certainly liked you’re page. Probably I’m going to bookmark your blog . You amazingly have fantastic articles and reviews. Appreciate it for sharing with us your blog. I just want to mention I am newbie to blogging and honestly loved you’re web-site. Probably I’m likely to bookmark your blog . You actually come with tremendous article content. Kudos for revealing your web-site. I simply want to say I am just all new to blogging and honestly liked this page. More than likely I’m likely to bookmark your website . You definitely come with exceptional articles and reviews. 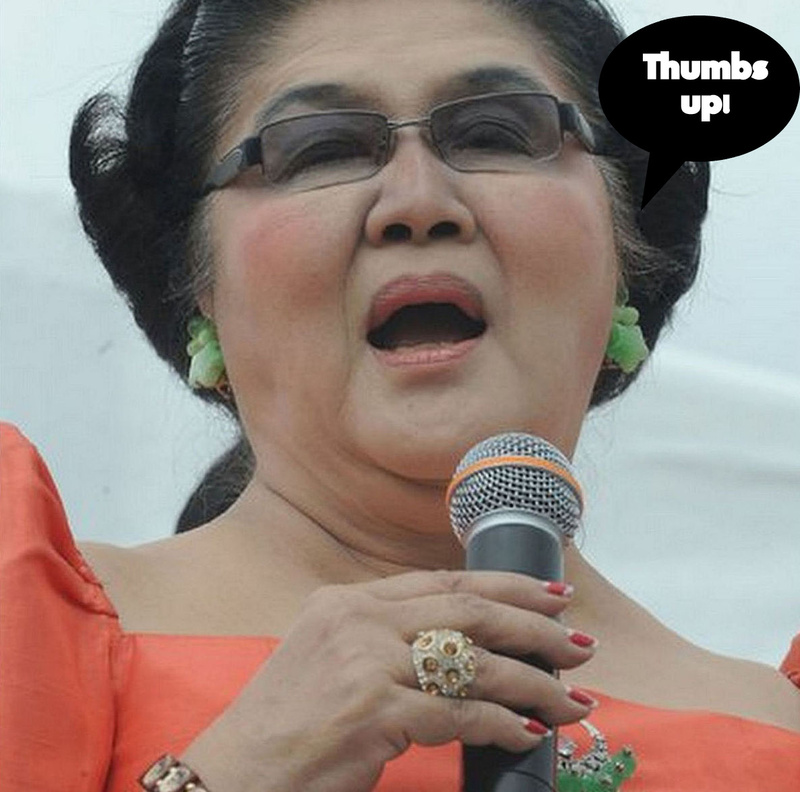 Cheers for sharing with us your webpage. I just want to say I am very new to weblog and truly loved you’re web blog. Likely I’m want to bookmark your website . You actually have exceptional writings. Thanks a bunch for sharing with us your blog site. I simply want to mention I am all new to blogging and honestly savored your blog. Very likely I’m likely to bookmark your blog . You surely have great writings. Bless you for sharing with us your blog site. I simply want to say I am just new to weblog and absolutely liked this blog site. More than likely I’m likely to bookmark your website . You actually have beneficial articles and reviews. Regards for sharing your webpage. I simply want to say I am beginner to blogging and absolutely savored this web blog. Most likely I’m going to bookmark your blog . You definitely come with perfect articles and reviews. Bless you for sharing with us your web page. I simply want to mention I am just newbie to blogging and site-building and absolutely savored this web page. Almost certainly I’m planning to bookmark your website . You really come with good articles and reviews. Many thanks for sharing your webpage. I¡¦ll right away grab your rss as I can’t in finding your e-mail subscription hyperlink or newsletter service. Do you have any? Please let me recognize in order that I may subscribe. Thanks. Hey there excellent blog! Does running a blog similar to this require a great deal of work? I’ve no understanding of coding however I was hoping to start my own blog in the near future. Anyway, if you have any recommendations or techniques for new blog owners please share. I understand this is off subject nevertheless I simply wanted to ask. Appreciate it! My husband and i were very contented that Michael could carry out his homework through the entire precious recommendations he made in your web site. It is now and again perplexing to just continually be handing out points which most people might have been selling. Therefore we already know we now have you to be grateful to because of that. Most of the explanations you’ve made, the straightforward website menu, the relationships you can make it possible to create – it is mostly spectacular, and it’s helping our son in addition to our family consider that the matter is entertaining, which is extraordinarily fundamental. Thanks for all the pieces! Great goods from you, man. I’ve understand your stuff previous to and you are just too excellent. I really like what you’ve acquired here, really like what you’re saying and the way in which you say it. You make it entertaining and you still care for to keep it wise. I can not wait to read far more from you. This is actually a terrific site. Hello.This post was extremely remarkable, especially since I was investigating for thoughts on this topic last Sunday. A lot of thanks for all of the hard work on this site. Ellie enjoys conducting internet research and it’s really obvious why. My spouse and i notice all relating to the dynamic form you create very helpful strategies via this web blog and encourage response from other ones on the point while our own daughter is undoubtedly becoming educated so much. Take pleasure in the rest of the new year. You’re carrying out a first class job. Thank you for any other fantastic post. Where else may anybody get that type of info in such an ideal way of writing? I’ve a presentation next week, and I’m on the look for such information. certainly like your web site but you need to check the spelling on quite a few of your posts. Several of them are rife with spelling problems and I to find it very troublesome to inform the truth then again I will certainly come again again. You are so awesome! I do not think I’ve truly read a single thing like that before. So good to discover another person with some unique thoughts on this subject. Really.. many thanks for starting this up. This website is one thing that is needed on the web, someone with a bit of originality! Some really nice and useful information on this site, as well I conceive the design and style has good features. Hello, I do think your web site might be having internet browser compatibility problems. Whenever I look at your blog in Safari, it looks fine but when opening in Internet Explorer, it’s got some overlapping issues. I merely wanted to give you a quick heads up! Besides that, wonderful blog! I will right away clutch your rss feed as I can’t in finding your email subscription link or newsletter service. Do you’ve any? Please allow me realize so that I may subscribe. Thanks. You are so interesting! I do not believe I’ve truly read a single thing like this before. So wonderful to discover another person with a few original thoughts on this subject matter. Really.. thank you for starting this up. This web site is something that’s needed on the web, someone with some originality! After looking at a number of the articles on your website, I really appreciate your way of writing a blog. I bookmarked it to my bookmark webpage list and will be checking back soon. Please visit my web site as well and tell me what you think. I’ll right away seize your rss as I can’t to find your email subscription link or e-newsletter service. Do you have any? Please allow me realize in order that I may subscribe. Thanks.